I’m back. One month and 8 days later. At this rate, I’ll finish my “baking through the alphabet” series in two years…hopefully that won’t happen! I know I haven’t been baking too much this past quarter. My friends ask me how my alphabet series is coming along, and I always say “I’m still on the letter A…but I’m getting there!” And I’m there now, starting with B! Making baby steps. I’m eight weeks into my fall quarter, so that means two more weeks of school (or 1.5, I should say), then finals week, then WINTER BREAK! Not that I’ll be doing a lot, but it’ll be nice to be back home during the week. This quarter has been one of the craziest yet, but not in the usual way. LIFE has been crazy, I should say. But hey, I’m still breathing, I still have my salvation, life is good. It took me foreverrrrrrr to decide what to do for the letter B. I wanted to do bo luo baos, but was too lazy to go buy bread flour. I wanted to make banana cream pie, but making a pie just seemed so tedious (I’ve never made a pie before! One of these days…). 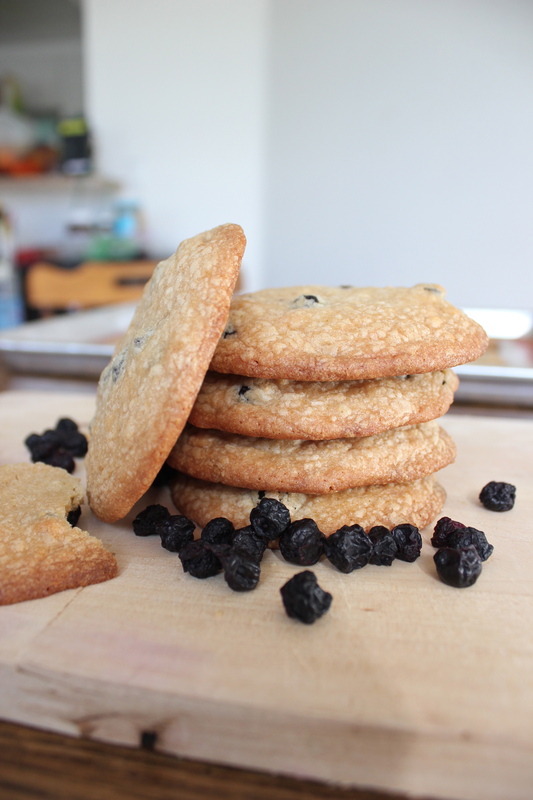 So there I was, flipping through my favorites section on foodgawker, when I found this–Momofuku’s blueberry and cream cookies. I’ve never had anything from the Milk Bar (AKA Momofuku Milk Bar), and I only heard about them through Facebook (I think a friend posted about them or something). But from what I hear and read, baked goodies from there are supposed to be really good. And I find their recipes online, and they’re super interesting and incorporate all these different things to it like “cereal milk” and “cornflake crunch.” Intriguing huh! 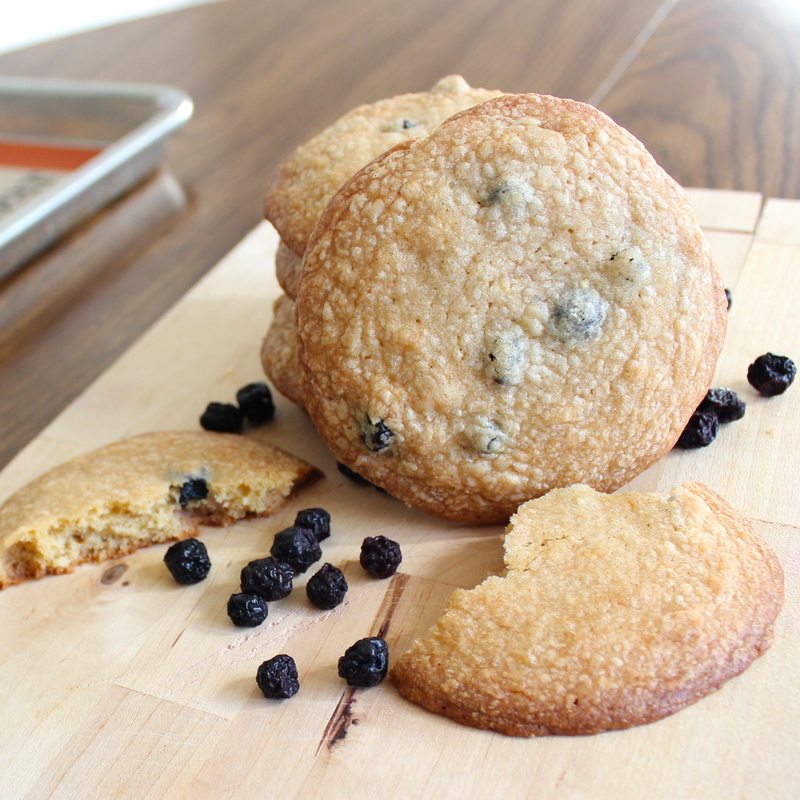 These cookies are really good–trust me. The edges are crisp and the center is chewy, just the way I like them. 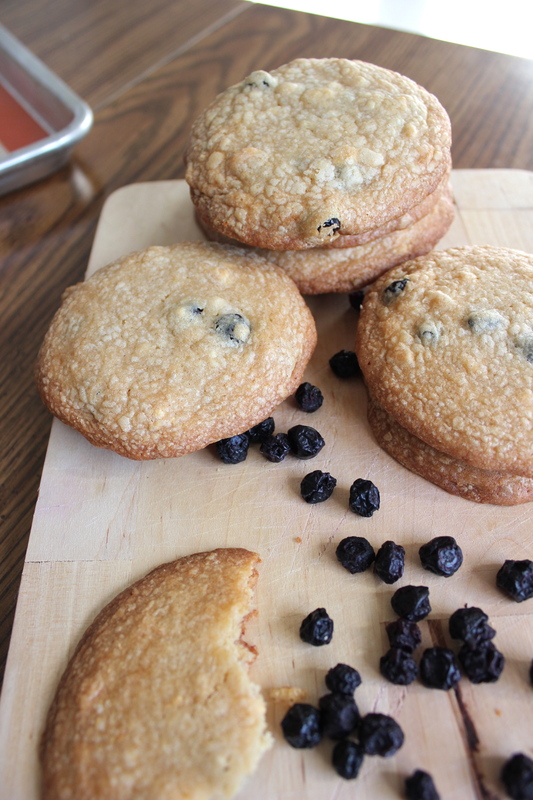 It’s not too sweet, and the blueberries add a nice tartness to the cookies. They remind me of a blueberry muffin top. These cookies are different than your normal recipe; there’s an extra step of adding “milk crumbs,” which is just nonfat dry milk powder, butter, and white chocolate. It’s an extra step, but I think it’s totally worth it! 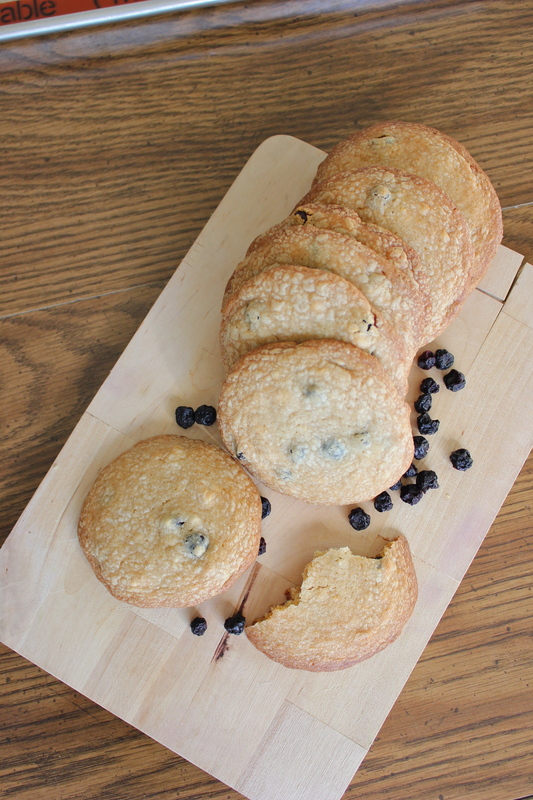 It adds a different taste to the cookies, and it’s the “cream” aspect for your blueberry and cream cookies! Don’t worry, making the milk crumbs is easy; it kind of reminds me of making a graham cracker crust for a cheesecake. DO IT. It adds this extra “milky” taste in the cookies that you really don’t find in other ones, and I like it and it’s delicious! 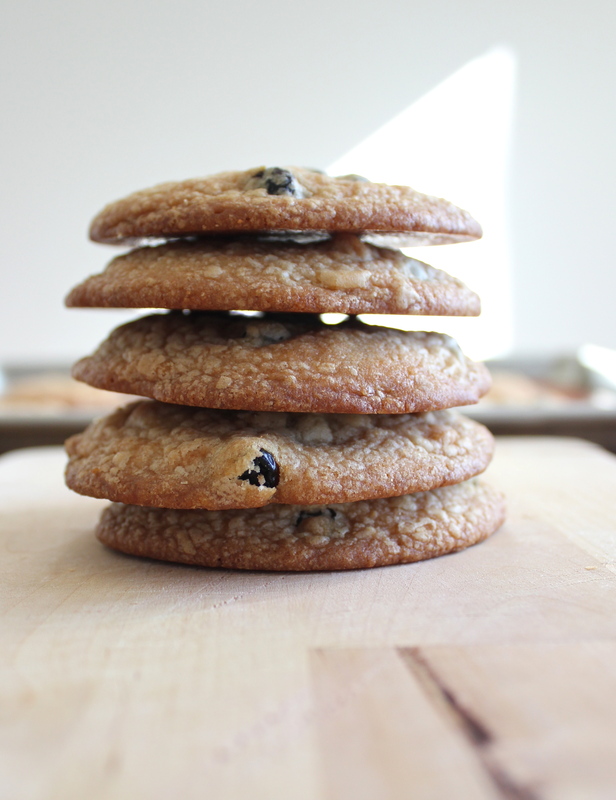 They’re thick and chewy, and I love the cracked aspect on top of the cookies. I have no idea what the real cookies are supposed to taste like, but if my cookie is supposed to be a copycat of the ones from the store, then the real ones must be HECKA GOOD. 1. Cream together the butter, sugars, and glucose (or light corn syrup) in the bowl of a stand mixer fitted with the paddle attachment (I used an electric mixer) on medium-high for 2-3 minutes. Scrape down the sides of the bowl, add the eggs, and beat for 7 to 8 minutes. 2. 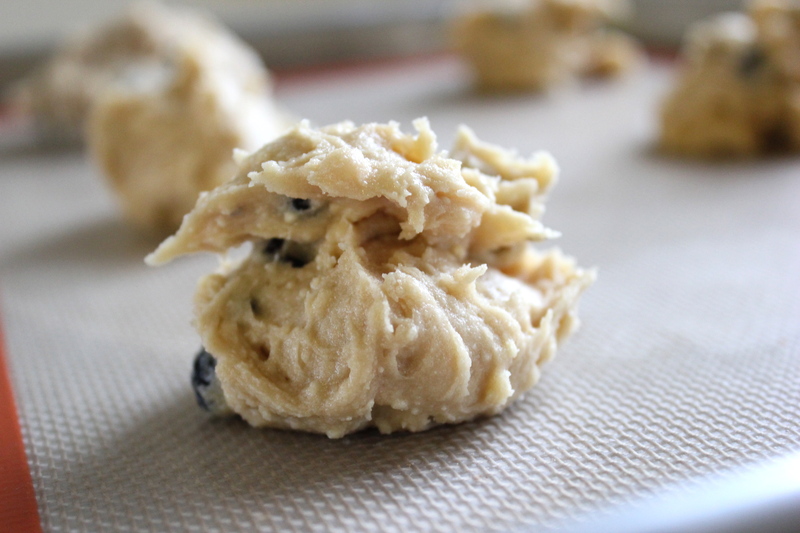 Reduce the mixer speed to low, and add the flour, baking powder, baking soda, and salt. Mix just until the dough comes together, no longer than a minute. Don’t overmix the dough, and scrape down the sides of the bowl. 3. On low speed (I did this part by hand), add the milk crumbs and mix until they’re incorporated, no more than 30 seconds. 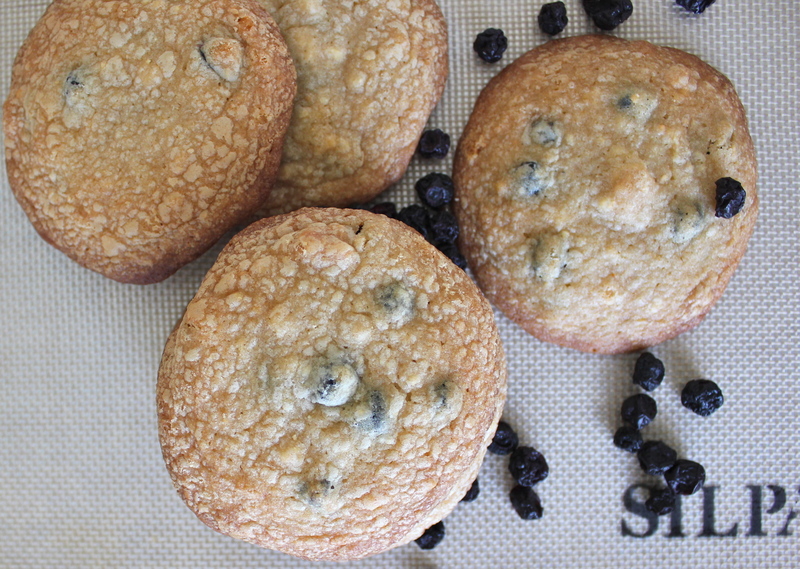 Add the dried blueberries, and mix them in for 30 seconds. 4. Portion out the cookie dough into balls (mine were probably 1.5-2 tablespoons, or use a 2 3/4 oz ice cream scoop) onto parchment-lined (I used Silpat) sheet pan. Pat the tops of the cookie balls flat. Wrap the sheet pan tightly with plastic wrap and refrigerate for at least 1 hour, or up to 1 week. I rolled the dough into balls after I refrigerated it, then refrigerated the dough balls again. Make sure you don’t bake them from room temperature, or they won’t bake correctly! 5. Preheat the oven to 350°F. Arrange the chilled dough balls at least 4-inches apart on parchment- or Silpat-lined sheet pans. Bake for 18 minutes until faintly browned on the edges but bright yellow in the center. Rotate your pans halfway through if necessary. 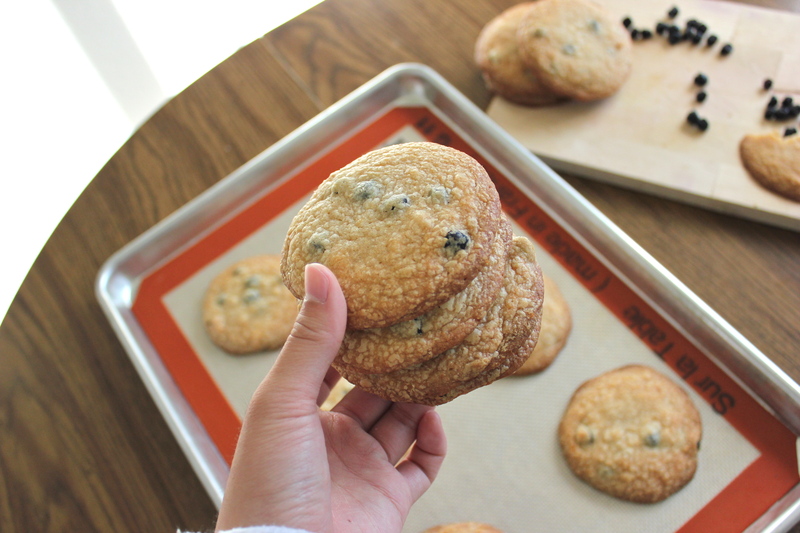 The cookies should puff, crackle, and spread. 6. Cool the cookies completely on the sheet pans. The cookies will keep fresh at room temperature for five days. Enjoy! 2. In a medium bowl, combine the 40 g (1/2 cup) milk powder, flour, cornstarch, sugar, and salt. Add the melted butter, and stir until a mixture starts to come together and forms small clusters. 3. Spread the clusters on a parchment- or Silpat-lined sheet pan and bake for 20 minutes. 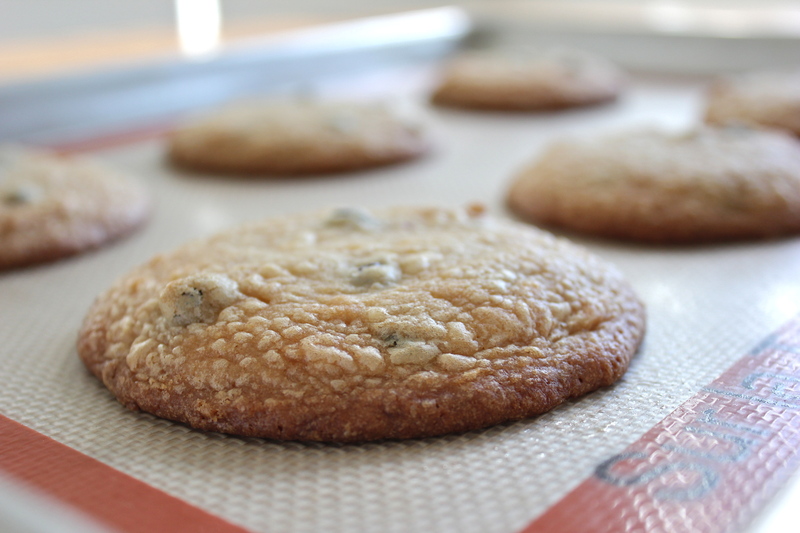 The crumbs should sandy, and (as the site puts it) your kitchen should smell like buttery heaven. Let the crumbs cool completely. 4. Crumble any crumb clusters that are larger than 1/2 inch in diameter. Put the crumbs in a medium bowl, and mix in the 20 g milk powder until it is evenly distributed. 5. Pour the white chocolate over the crumbs, and toss until the clusters are coated with the chocolate. Keep tossing them every five minutes until the chocolate hardens and the clusters are no longer sticky. 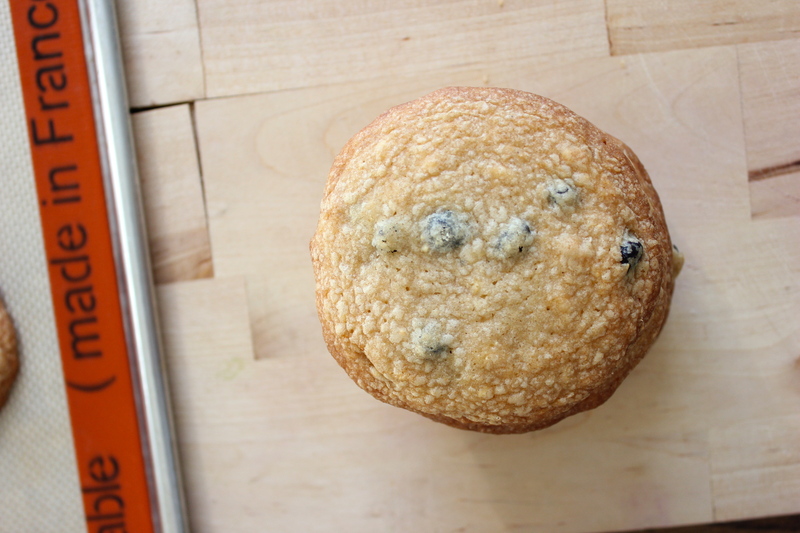 The crumbs will keep in an airtight container in the fridge or freezer for up to a month. 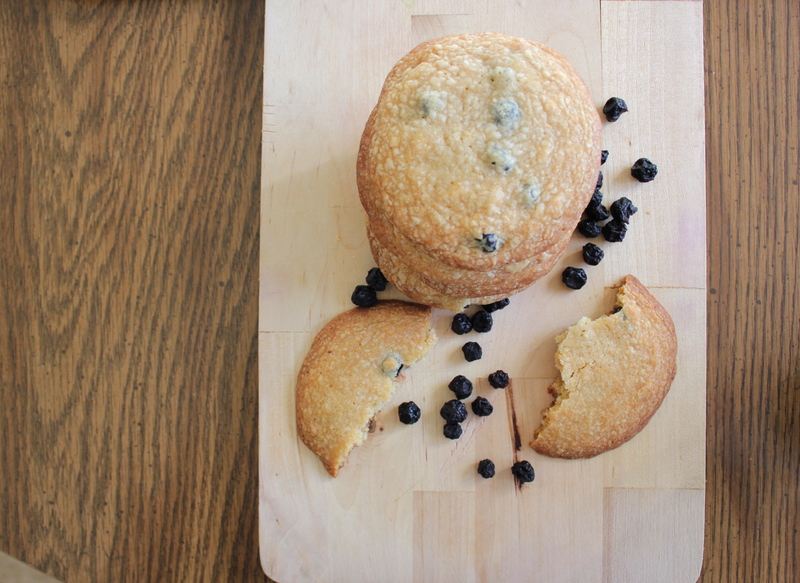 This entry was posted in Baking Through the Alphabet, Desserts and tagged baking, blueberries, blueberry and cream cookies, cookies, momofuku, Momofuku Milk Bar. Bookmark the permalink. I really love your site. Everything look so delicious. Keep up the great work and God Bless.